A visitor's "lost" cell phone leads to inventive problem solving at the Lemelson Center. Sitting at my office desk one recent Thursday, I received an unusual call around 4 p.m. from my colleague Zach Etsch, a lead facilitator in Spark!Lab. He asked: “Do you have a key to the Hartford interactive in Places of Invention?” Long story short, a visitor had accidentally dropped her cell phone behind an interactive table in our exhibition, and Zach hoped we could reach it through the AV cabinet underneath. To assess the situation, I headed toward the Lemelson Hall of Invention and Innovation—which encompasses our Draper Spark!Lab hands-on gallery, Places of Invention (POI), and a smaller exhibition Inventive Minds—in the museum’s new Innovation wing. 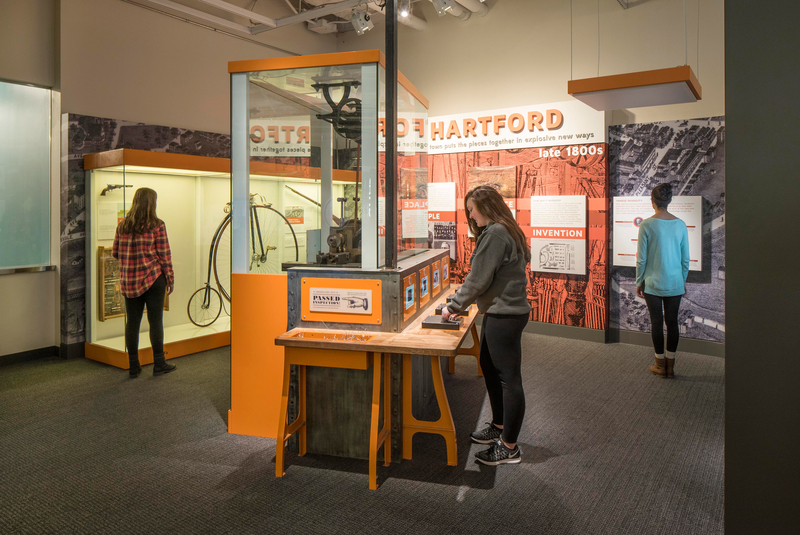 In the Lemelson Center's Places of Invention exhibition, one of the six American case studies is Hartford, Connecticut, Late 1800s: Factory Town Puts the Pieces Together in Explosive New Ways. 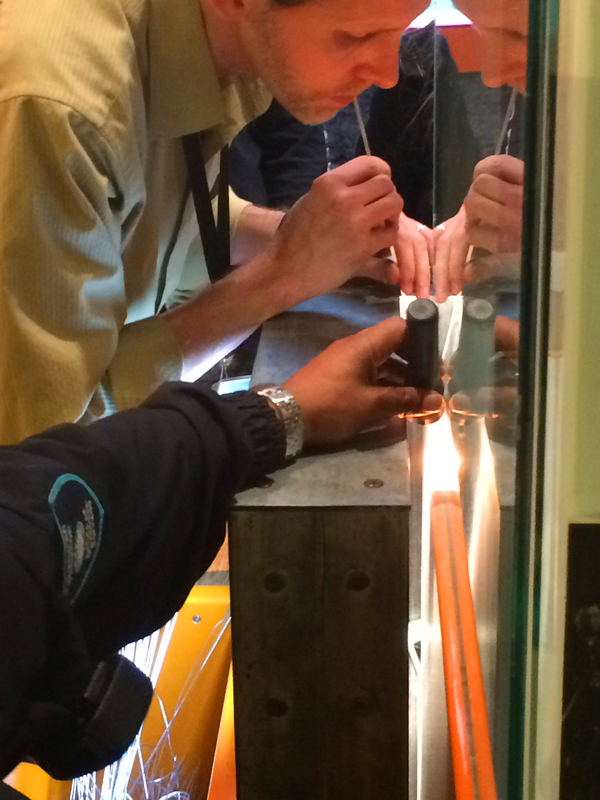 In the center of the case study is an interactive station where visitors can make a picture holder out of wire using custom-made jigs to learn about the manufacture of interchangeable parts in 19th-century Hartford. 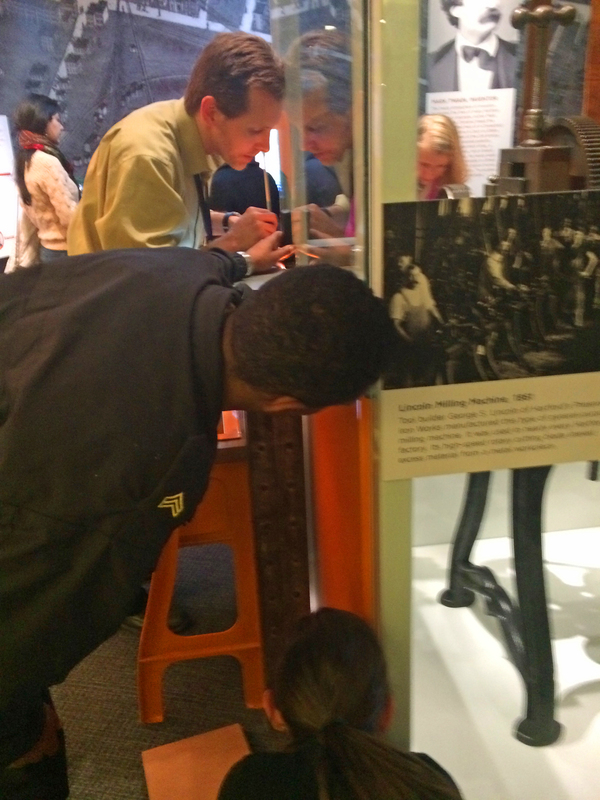 The interactive station table surrounds three sides of an exhibit vitrine displaying an 1861 Lincoln milling machine. I arrived at the POI gallery to find a distraught teenager (I’ll call her Holly) and her supportive school friends huddled together. On a field trip from another state, they were due to leave the museum at 5 p.m. and head to New York early the next morning. Sixteen-year-old Holly was very concerned about not having her cell phone to contact her parents while traveling far away from home. Unfortunately, it turned out her smart phone had slipped down to the ground, stuck in a seemingly inaccessible corner between the interior wall of the table structure and a huge exhibition vitrine (museum speak for an object case). Assuming we would need help from our museum riggers—the team of people who transport, install, and deinstall heavy objects—to move the extremely heavy steel-based structure, I told Holly we might not be able to reach her phone until after she left. However, we would try our best to retrieve it. Given our status as the Smithsonian’s invention and innovation center, Lemelson team members pride ourselves on “living the mission” as creative problem solvers. My colleague who exemplifies this most is Tim Pula, the Spark!Lab interpretive exhibit coordinator who spends his work days developing new hands-on interactive experiences. He returned from a meeting around 4:30 p.m. just as security officer Sergeant Patrick Newman, Spark!Lab floor manager Jocelyn Knauf, and I were running out of ideas. Patrick had tried to use a long-handled grabber device but it was too thick to fit between the table and vitrine. Jocelyn had two long T-square rulers, one metal and one wood, but couldn’t get enough leverage to lift the phone even when she added duct tape to the ends. Fortunately, the previous day Tim had created a new tool for another project perfectly suited for addressing this problem. It is a long, thin metal rod with a hook on one end. Surrounded by Holly’s friends (she couldn’t bear to watch), Tim slid the rod down into the corner and Jocelyn slid one of the rulers underneath the phone while Patrick held a flashlight overhead so they could see what they were doing. Several times it seemed like they had the phone under control as they slowly slid it up the wall, but then it would get stuck again or fall off the rod’s curved end. I tried to reassure Holly with running commentary while taking photos. (I believe in documenting the inventive process!) It took about 20 minutes but finally—voila!—the phone emerged above the table’s edge. Here you can see Tim Pula (top), Sergeant Patrick newman (center), and Jocelyn Knauf (bottom) working on retrieving a visitor's cell phone from behind the Hartford interactive table. You can just see the edge of the visitor's cell phone stuck in the corner as Tim Pula tried to retrieve it from above and Sergeant Patrick Newman holds the flashlight for better viewing. Holly and her friends thanked us profusely, with her hugging everybody and her friends shaking hands all around. Then off they ran to their bus while I took a final picture of the inventive cell phone retrieval trio. 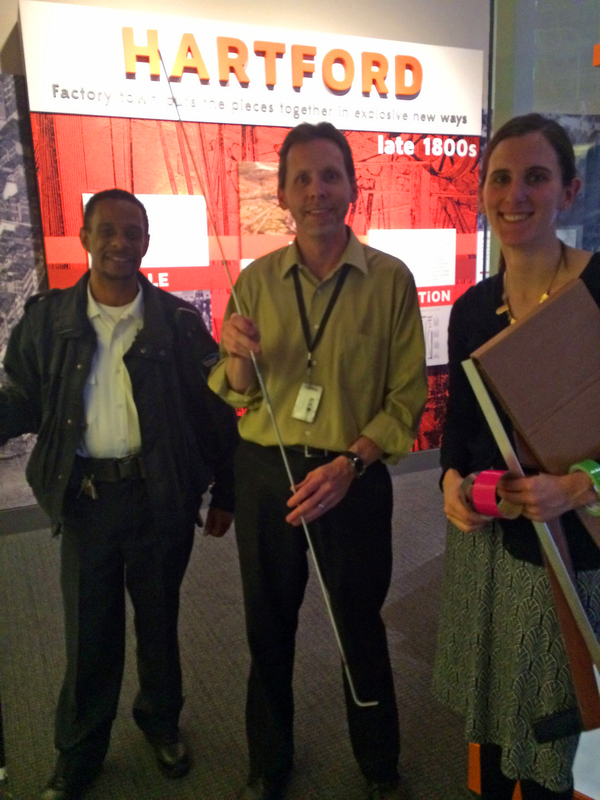 Here is the inventive cell phone retrieval trio with their tools: Sergeant Patrick Newman (left; grabber tool not seen in photo); Tim Pula (center; holding hooked rod); and Joceyln Knauf (right; holding rulers and duct tape). Just another day at NMAH's Lemelson Center with my awesome colleagues!